The Fratton faithful frequently had their appetite for transfer news whetted throughout the summer and in January. Sean Longstaff and Ryan Yates were names that persistently cropped up. Both were on the cusp of switching to Fratton Park – only for the plug to be pulled at the 11th hour on each. The midfielders remained at parent clubs Newcastle and Nottingham Forest respectively. Longstaff was earmarked to join the Blues on loan during the summer as boss Kenny Jackett was assembling a squad capable of winning promotion from League One. The Magpies academy graduate was keen to move to the south coast. Toon boss Rafa Benitez refused to sanction the deal, though, as he had little cash available to bring in fresh faces. Longstaff had to remain at St James’ Park. The scintillating performances of Ben Thompson meant the 21-year-old’s name was swiftly forgotten, though. 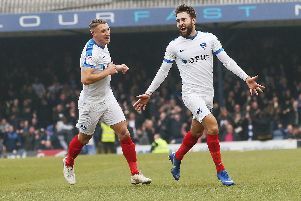 The Millwall loanee’s dazzling displays in the engine room were the linchpin to Pompey leading the title race during the first half of the campaign. Yet Thompson was recalled back to his parent club after lighting up League One. Around the same time, Longstaff’s name started to crop again crop up. But it wasn’t that the Blues were again close to signing him. Longstaff was handed his Premier League debut in the 4-0 defeat to Liverpool on Boxing Day and he’s since established himself in the Magpies’ starting line-up. He’s featured in Newcastle’s past five top-flight game – including the 2-1 win over champions Manchester City – and has earned plaudits from the likes of Alan Shearer, Gary Lineker and Jamie Redknapp. Thompson’s departure has no doubt represented a significant blow to the Blues. In fact, Jackett’s side are winless in their subsequent five league games without the 23-year-old. The man who could possibly have filled the void Thompson left was Yates. Down the pecking order at Nottingham Forest and confined to under-23s football for the opening half of the season, an opportunity for regular first-team football at Fratton was something that appealed. Yates was a serious target for Pompey last month and it looked like he’d be making the move to PO4 after reportedly being in the stands for the 3-1 win over Sunderland. Speculation surrounding Forest manager Aitor Karanka’s future put the 21-year-old’s switch on ice. The Spaniard did depart the City Ground, with Martin O’Neill taking the reins. The new manager gave everyone a fresh chance to impress – putting paid to Yates’ Pompey switch which was in the offing. The former Scunthorpe loanee featured twice since O’Neill’s arrival and caught the eye in the Championship. An impressive performance in Forest’s 2-1 win over Brentford on Saturday was followed up with a man-of-the-match display and maiden goal for the club in the 2-2 draw at West Brown on Tuesday. Longstaff and Yates are two players who would surely have made a significant difference to Pompey’s promotion push. The fact they’re performing at higher levels underlines the impact they could have made in League One. The Blues can certainly count themselves unlucky not to have captured either. But if there is one positive to take then it shows the strength of the Blues’ recruitment department. The likes of Jackett, Phil Boardman & Co underlined their diligence to identify and almost capture players of Longstaff and Yates’ ilk.